Seven Lies over the past eight years has built a following in the club and rock scene of Vancouver with their unique electronic rock sound. Seven Lies captures the energy of new wave without treading the waters of nostalgia and blends it with melodic electronica to recreate an emotional edge reminiscent of the 80’s. Dave Bowman (formerly of Soul Decision) leads the band with his powerful vocals and melodic hooks, along with Jackson on Keyboards, Sean Nisbet-Jones on Guitar and Dan Esterreicher on Bass. 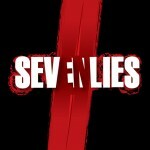 The third album from Seven Lies continues their evolution and includes a more electronic dance sound. Their new album “Devoted” is full of rhythm drenched dance tunes like “Follow You” “Devoted” and “Play That Music Loud”, some stylistic moody electronica like “Come Down” and “Bang Bang” and well written ballads like “Make Up Time” and You’re So Beautiful” that can really sweep you up into refection. Devoted will be released worldwide on October 23, 2010 and the first single (TBA) will go to radio Canada wide. Sneak previews are available on the band website. This will follow their previous radio success with “Letting Go”, “She’s So” and “Endure” that earned a Canada wide listening audience with over 50 stations adding them to their playlists. In 2002 Dave Bowman (formerly of the band soulDecision) and long-time friend and collaborator, Jackson, began a writing relationship that would become the creative axis behind the Seven Lies sound. By the fall of 2003, Seven Lies became fused with the creative influx of local rockers: Murray Atkinson, Graham Pence, and Morgan Littlejohn. Each new addition drew in a cache of influences (Depeche Mode, Smashing Pumpkins, Led Zepplin, Oasis, Dj Tiesto) and with them more devoted followers. Forming a following in the underground club and rock scene of Vancouver, Seven Lies truly began to temper their unique electronic rock sound. Seven Lies captures the energy of classic rock without treading the waters of nostalgia and blends it with melodic electronica to recreate an emotional edge reminiscent of New Order. Extensive private rehearsals served to harness the resulting explosion that can best be described as progressive, refreshing, and fully realized. No one could have predicted the overwhelming support that would lead Seven Lies to set a record attendance and sell out their very first show at The Roxy in Vancouver. Seven Lies continued to win over fans at every local venue that could contain their spontaneous and powerful live show. Locally, they began transcending traditional genre boundaries, even opening for hip-hop acts Rascalz, Swollen Members, and Sweatshop Union proving their wide audience appeal and live show energy. Breaking away from regional rockers, traditionally dominating the Vancouver music scene, Seven Lies quickly found support at Brand X Records. Spring 2004 they released their first album “ORIGIN” with the single “Letting Go” to radio, which was well received by over 50 stations. This was followed with the release of “She’s So” in September, which was again widely received across Canada and Northern States, on both College and regional radio. With the album selling well, Seven Lies followed the positive response of their singles with accompanying videos after winning a Factor grant for “She’s So” and the Brand X funded Letting go video. A video release party thrown to preview “She’s So” also added to local excitement for this band, when an over-capacity crowd of 600 people turned up and struggled to gain access to the event. Media coverage was extensive as fans lined up until closing to view the new Seven Lies video. The band’s popularity continued to grow, but now internationally, via “Yahoo Launch”, other music sites and online based Street Teams. The Seven Lies website traffic continued to accelerate with over 70,000 song downloads, 800,000 visitors and the message board having over 200,000 visitors with over 2000 fan posts. These are some impressive numbers for a band that was still very new. Performing in “Hollywood North”, Seven Lies have also won over many famous fans such as K-os, The Killers, Ryan Phillipe, Justin Timberlake, Jason Statham, Tara Reid, Christian Slater, and Kelly Osbourne. 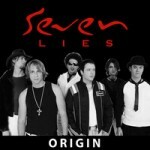 In 2006 Brand X Records knew it was time to get Seven Lies back into the studio and lay down the same emotion and energy that was emerging from their live shows. Fourteen of a collection of 30 demo tracks were chosen to be recorded for the new album. With a clear vision, Seven Lies confidently self-produced their second album over 12 months. Brand X brought drummer, Esah, into the picture to further enhance the band’s driving beats. Seven Lies released their album named “DRIVE” late 2006 and toured all around the west coast including opening for April Wine on Grey Cup weekend for 2000 people, New Years Eve 2007 for a crowd of 5000, and the UBC Rush Party for 1800 students. Seven Lies also licensed 12 songs through Feldman & Associates for soundtracks on the hit television show “Whistler” which is aired in Canada, USA and England . Seven Lies released their new single “Endure” across Canada with adds to over 45 Radio Stations. In 2008, Seven Lies starting recording songs for their third album. Over the next two years they would write and record 23 songs and choose ten of them for the new album. 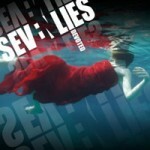 September 2010, the new Seven Lies album Devoted was released. With this new album came not only a new sound but a new line up of members – Guitarist Sean, and Bassist Dan joins Dave and Jackson.